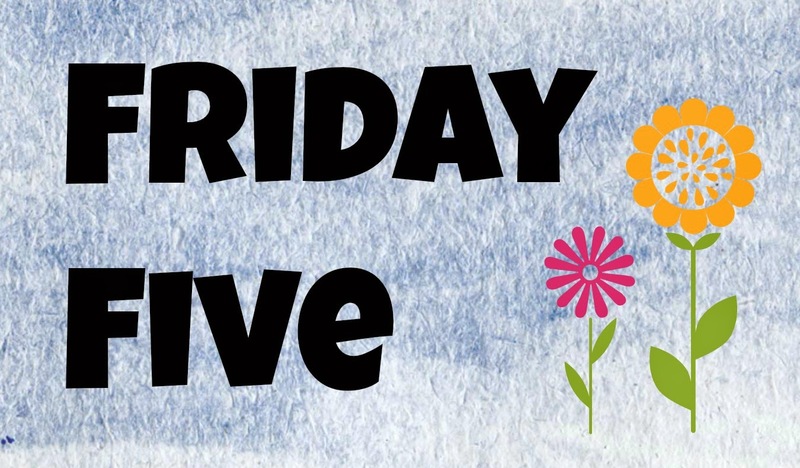 So I thought it might be fun this summer to try writing a more personal post every Friday highlighting some things going on in my life that aren't necessarily book related. Let me know what you think! 1. Etsy Finds - We moved this past fall and we are slowly decorating our house. 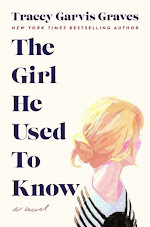 I found this awesome Etsy store, ReImagination Prints, and they make some fantastic literary prints out of old books. How cool is that? 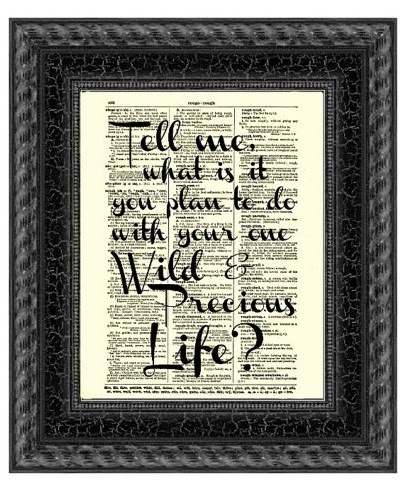 I bought this one depicting my favorite quote from Mary Oliver and it's printed on an antique dictionary page. I also got one from The Great Gatsby and another from It's a Wonderful Life. I highly recommend this store! 2. My View - I was at the beach for 4th of July! I have been on and off sick for the past few weeks, so we didn't get to go down to the shore as long as I had hoped over the 4th, but hey, at least I got there! This view cures every ailment, right? 3. Margaritaville and Landshark Bar and Grill, Atlantic City - I met some friends out in Atlantic City not far from where I was staying at the beach over my weekend. I hadn't been to Atlantic City for years, but it was fun to have some adult time. There were great views of Steel Pier lit up at night from the outside deck. 4. More Antiques- There is an incredible antique store, Teaberry Antiques, that we hit up quite often when we are down the shore. I found an old 1915 copy of Treasure Island hiding in a corner. How incredible is this book? I love old books! 5. 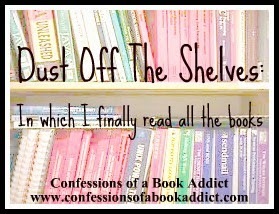 Dust Off the Shelves Feature - I started this feature in January and I am really struggling mostly because so many good books are coming out that I forget to read the books I have. So far, I have only read Looking for Alaska by John Green and Nine Rules to Break When Romancing a Rake by Sarah MacLean….both very good, but only two since January? Oh, man. That is not good, especially since I was hoping to read one book a month from my list! Ooops! I am making it a personal goal to read at least one book that is collecting dust by the end of the summer. Help me decide which "oldie-but-goodie" to read next! Which "Oldie-but-Goodie" Should I Read Next? I'm so glad I don't have a place for myself otherwise I would be broke with the things I would buy from Etsy. I can just scroll those goodies on there for hours! I know exactly what you mean about not being able to read old books with new books coming out and ARCs and all that good stuff. I've accumulated too many books that way. I have a new policy for myself where I make sure to read at least 2 of my previously owned books and it works! I know, right?! Etsy is so addicting. I am finding all sorts of things I "must have." I think I'll be reading Just Listen next….thanks for visiting, Nick! Those etsy prints are a pinner's dream! They're so pretty and original, I may become bankrupt very soon!! I know, right?! I bought three…I LOVE them! 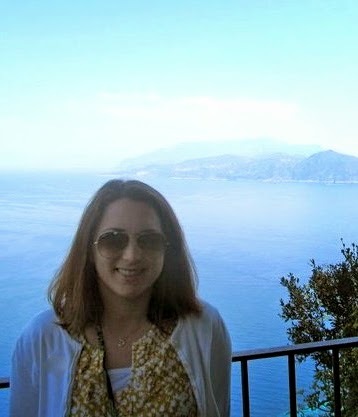 Thanks for visiting, Sarah! 1. I love that quote! I read GOLDEN recently, so I've had it swirling around in my mind the last few weeks. Love that print! 2. So pretty. Hope you're doing better, now! I KNOW!!! I love that this quote is so important in Golden…so fabulous! Thanks, Lea! I am feeling a lot better. :) Thanks for visiting! The Etsy prints are so cool. It also reminds me of Golden. I loved the use of the quote in that book. I'm glad you had a chance to get to the shore and hope you are feeling better. I've only been to Atlantic City once and it was in the winter, so I've never experienced it like that. I've bought quite a few books from the second hand store lately, but haven't been getting to them either, so I understand your struggle. New books almost always win out. I loved Golden and Kirby's use of that quote, too. :) Thanks, Natalie! I am feeling a lot better! I got your message over Twitter…will definitely write back! Thanks for visiting!